– for intense sequences of adventure violence, including frightening images. 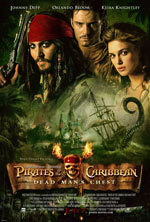 Pirates of the Caribbean: Dead Man’s Chest picks up shortly after the end of the last film, as Elizabeth and Will are about to tie the knot, but are arrested for helping Jack escape in the previous film. Dead Man’s Chest is about as good as sequels come, despite containing some of the usual problems that come with sequels, as well. Much of Dead Man’s Chest is brilliant, actually. The filmmakers take pride in the follow-up, and have clearly put plenty of time and attention to detail into it. 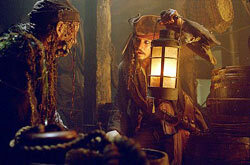 Bringing such a complex character as Davy Jones, someone only ever talked about as sort of an analogy, is a clever thematic decision, especially since his name was referenced in the original. This also makes for an ingenious plot development to bring yet another character mentioned in the first film to light in the sequel. The films mesh so well, it’s fantastic. My biggest, and really only real gripe from the beginning was the way the story got moving. There’s a prolonged, somewhat unexplained, and rather unnecessary sequence that takes place on an island with a tribe of natives that’s mostly silly and disposable. Not only does it just make the film longer, but it just felt unneeded. It does make for a few good laughs and excitement, but overall, some moments were just too cheesy or silly to really fit into the Pirates story. Also, this film is significantly darker and more violent than the first. While revisiting The Curse Of The Black Pearl recently reminded me of just how violent some scenes were, there seemed to be even more of it this time around. From off-screen throat-cutting, on-screen eye gouging, and blood-covered dying pirates, to a few shots of gory stumps from a sea creature, there’s a lot about Dead Man’s Chest that isn’t appropriate for younger viewers. Director Gore Verbinski lets the content drift into unnecessarily violent territory many times throughout the film’s duration, including gory or just plain really violent moments. And just the sight of Davy Jones and his pirates will likely scare the young ones. For the second outing, everyone gives great performances once again. 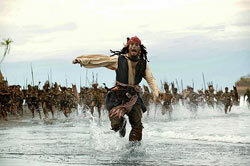 Depp is still the best and most memorable pirate in history as Captain Jack Sparrow. Although his performance is slightly goofier this time, Depp still holds it together with Sparrow as the glue for the film. But some of the best sequences are when the old team reunites with Knightley’s Elizabeth and Bloom’s Will thrown into the mix. Some other familiar faces from the first also return, including most of the Black Pearl’s pirate crew (including some of the lovably mischievous ones from the first film who are for the first time no longer under the curse from the last story). Anyone who loved The Curse Of The Black Pearl will have a lot of fun with the jokes that reference it and the reprised roles. Verbinski takes each character a little bit further (as can be expected in a sequel), but never quite goes to such absurd or genuinely stupid changes that Stephen Sommers made with the characters for The Mummy Returns. Bill Nighy was a perfect choice for the sinister Davy Jones. The effects used for Jones were also remarkable. While some of his ship’s pirates didn’t quite fair as well as Jones did, with some effects just being a bit too animated or cheesy, the overall look was done very well. The Cracken was also one incredibly menacing creature that looked amazing on film, making for some of the most exciting action scenes in Dead Man’s Chest. Nighy was almost unrecognizable underneath a suit of CGI, but enough of his personality shown through to help make his performance almost as memorable as Barbossa from the first film — but most definitely altogether more menacing! Pirates of the Caribbean: Dead Man’s Chest builds throughout its duration to an exciting and shocking finish, in more ways than one. So many plot threads come to a temporary close that leave the film about as wide open as possible. It’s a cliffhanger ending that is almost as hard to swallow and move on from as the ending of The Fellowship Of The Ring was several years ago. So while the film doesn’t necessarily best its original, it’s a good sequel. Verbinski really needs to tone down the violence in these films so families can enjoy them (especially if Sparrow’s image is getting slapped on cereal boxes and Happy Meal toys). But in the end, after the credits roll (and wait till the very end! ), one thing rings true… Pirates Of The Caribbean: At World’s End can’t come too soon when it finally hits theaters next May!